The dollar yen chart reacted in typical fashion last week as the Bank of Japan interevened in the currency markets once again, once the currency approached and then touched the 85 trigger resulting in the BOJ taking some positive action. 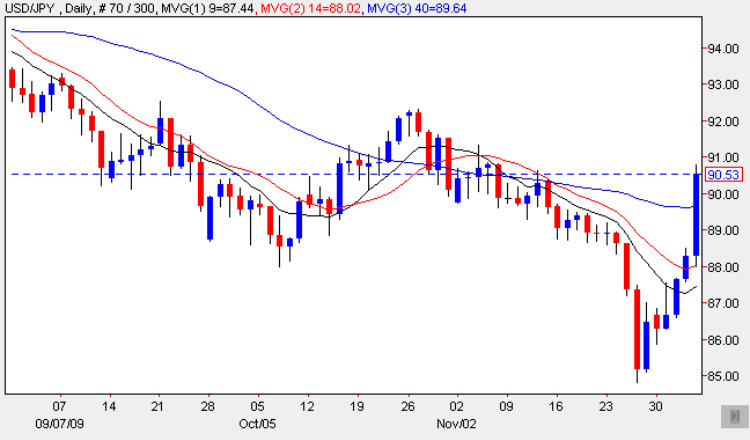 To regular currency traders such as myself, intervention has been on the cards and came as the dollar yen touched a fourteen year low. Last week’s action was signalled by the Minister of National Strategy, Naoto Kan, who said that “the BOJ and and Government would act together to deal with the rising yen, and that they would consider all options on what action to take”. It was clear from last week’s price action that they have already moved to prevent any further strengthening of the Japanese yen, with dramatic results!! The fear, of course, from the authorities is that a strong yen will will once again hurt their export market and plunge the country back into a fresh period of deflation, from which it has only just emerged. From a speculator’s perspective the move was widely expected (myself included) which only added to the upwards momentum when intervention duly arrived, and help to power the currency pair back into safer waters as far as the BOJ are concerned, breaking well above all three moving averages and clearing the 90 price handle to boot! All in all, a good week’s work for the Bank of Japan which will now sit back and wait to see whether their intervention has provided sufficient momentum for the currency pair to continue higher this week and break through the strong level of potential resistance now in place in the 89 to 92 price region, with a move through here signalling a strong move higher in the medium term – perhaps aided even further by the BOJ. The only items of fundamental news for this pair are in the US with a speech from Ben Bernanke and the Consumer Credit data – both of which are covered on the main eurodollar site.